New York Gov. 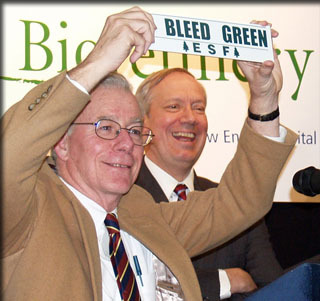 George Pataki announced a $10.2 million grant to ESF and three commercial partners to develop the first biorefinery in the U.S.
Pataki made the announcement Dec. 20 at a press conference on the ESF campus. ESF will work with Catalyst Renewables Corporation headquartered in Dallas, Tx., the engineering firm of O’Brien and Gere based in Syracuse, and New Energy Capital, one of the country’s leading energy venture capital companies, to develop and construct a pilot commercial cellulosic ethanol facility in Lyonsdale, NY. The Lyonsdale grant was one of two Pataki announced; a business-academic consortium led by Mascoma Corporation out of Massachusetts will build an ethanol pilot facility in Monroe County. The grants are administered through a partnership from the New York Dept. of Agriculture & Markets and the New York State Energy Research and Development Authority (NYSERDA). Nathanael Greene, senior policy analyst at the Natural Resources Defense Council (NRDC), said, “Cellulosic ethanol is a homegrown fuel that has the potential to play a huge role in our clean energy future by reducing our dependence on oil. By building the first cellulosic ethanol plants in the United States, New York is paving the way for the rest of the nation and the world in ways that will help both the economy and environment. Catalyst Renewables is a renewable energy company that currently owns two biomass-to-energy plants in New York. The new biorefinery will be constructed adjacent to the company’s existing wood-to-energy plant in Lyonsdale, located in Lewis County. Previously, ESF worked with Catalyst Renewables to establish the first commercial willow plantation in the U.S. in the Tug Hill area of Jefferson County. In addition to willow, the Lyonsdale facility will use low-grade timber from surrounding North Country forests to produce an estimated 130,000 gallons of cellulosic ethanol per year and other bio-based energy products. The plant also will generate electricity. The state grants will be matched by the companies involved resulting in a significant private investment in the Lyonsdale and Monroe County facilities. The projects are expected to initially create 48 permanent jobs, with the potential to generate more jobs in the years ahead. In addition, the facilities will create new markets for 45 tons of biomass per day, which will generate approximately $10 million in the local economies over the next three years.